Nihar Naturals is a famous Indian Brand under Marico Industries . Nihar Naturals believe in the Spirit and Strength of Womanhood . They are doing campaigns to support child education in India . Vidya Balan the Brand Ambassador of Nihar Naturals has been a part of many such campaigns which supports child education . In 2013 they had unveiled its ” chotte khadam pragrati ki aur ” campaign in Mirzapur , Uttar Pradesh. Which contributed to the cause of child education in India. 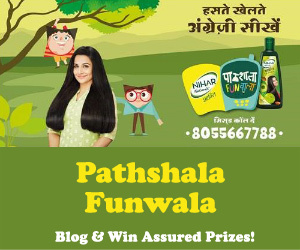 Recently Nihar Naturals have launched an initiative called Pathshala Funwala to make education accessible any where , any time . This initiative is for kids who want to learn English but do not have access to learn it . One can dial the toll free number 8055667788 and learn English in a simple and fun way . This program was started in February 2017 and till date more than 7 lakh students have been benefitted by this . This Pathshala Funwala is an innovative mobile phone based learning system , where as one needs to dial the toll free number and it will help to learn English in a fun way . This is a Great work done by Nihar Naturals as it helps poor kids specially in rural areas to learn English in a fun and easy way . In India there are still many poor kids both in urban and rural area who are not able to fulfill their dream of getting proper education specially learning English because of many factors . So for such kids and people this is a great way to learn English and feel connected to outer world and feel confident . Vidya Balan Spoke from Lucknow at the event of Nihar Naturals Pathshala Funwala and putting emphasis on the importance of education she said ” Education is the birth right of every individual and child , so whether you come from urban or rural area , education can be a big differentiator ” . She is right , Education can change one’s life . Every child rich or poor , from rural area or urban area has the right to get basic education . Education not only gives formal education but also teaches basic manners , etiquettes , life skills etc . One feels confident and connected with world . One can talk of politics and science and almost can understand every thing happening in world . Education is like to tool or weapon to fight all odd’s of life . One gets respect in society , one feels on the Top of World with power of Knowledge and Education . Learning English is a basic thing as medium of higher education is English every where . Education can not only change one’s life but also can change one’s future and their family’s destiny . So every Indian specially young generation needs to learn English for their self improvement . As an educated nation can be more progressive . In many rural areas there are not sufficient schools and colleges so that children of those areas can get proper education . In urban areas also there are many poor kids who are not able to attend school because of family responsibilities as their parents send them for work in some factories , hotels , shops etc . Their dream of getting education and learning English remains a dream , for such kids this Program is a boon as they can learn English in their free time with out worrying about attending school . There are many poor kids in my locality who are not attending school for various reasons , I am going to share this with them , Will motivate them to get interested in this and would ask them to try this toll free number and learn English , Would Love to see Sweet Smile on their face when they will learn English and feel confident . And finally would like to Thank Nihar Naturals for coming up with such useful and wonderful programs for Indian kids .